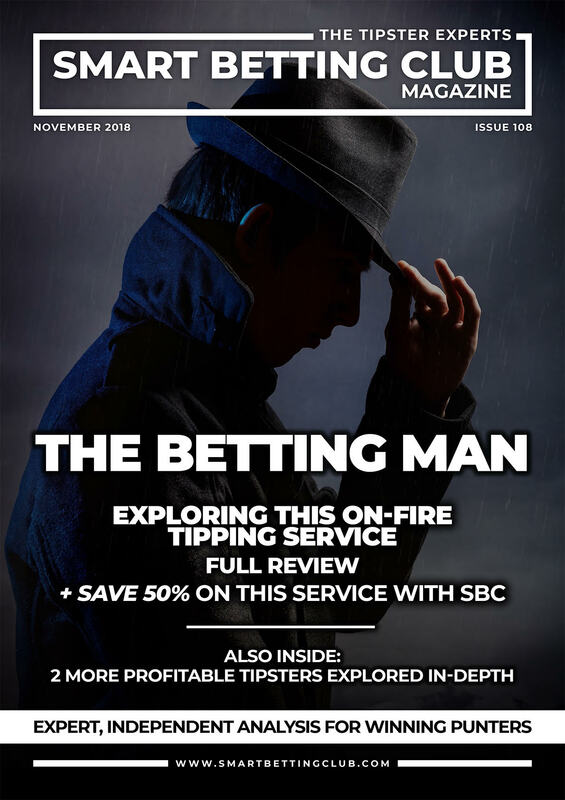 Last week saw the release of the very latest SBC Magazine – Issue 108 which featured reviews of 3 new winning tipsters to help in your profitable betting quest. Chief amongst them was our exploration of ‘The Betting Man‘ service, which since inception back in November 2017 has produced some exceptional results, having made 328 points at 27.2% Return on Investment. In fact since our original review was published – he has picked up an extra 28 points profit, including a 16/1 winner on Friday, so he remains in red-hot form. Yet as good as his form has been, as tipster reviewers we always need to delve much deeper than simple headline profit figures to get the real lowdown on how good a service really is – including one of the most vital topics – Odds Movement. In today’s racing betting world – one thing we must always explore before considering joining a tipster is exactly how fair the odds they quote actually are. Because if a tipster puts up a bet at 16/1, yet this price is slashed within seconds to 12/1, before going into 8/1 within 15 minutes, then the reality is that it will be very difficult to match the prices quoted. A tipster good in theory, but not in practice. Therefore, as part of our detailed tipster review process, we run an odds tracking analysis study, which gauges the odds a tipster quotes and how quickly these prices move (or not) over time. Exploring the practicality of following a tipster in the real world. In The Betting Man’s case we tracked the odds movement of his tips for 2 1/2 months from a group of major bookmakers. Comparing his advised odds with those immediately available upon receipt of his tips, the best odds after 15 minutes had elapsed, at 1030am and finally at SP. During this 2 1/2 month odds tracking period, The Betting Man had a fantastic time, making a ROI of 54.3% and over 100 points profit so it was an intriguing time to run such a study! The key figure to look at here is the ROI Difference percentage as the odds available upon the tips being received were actually 3.2% better than those he was advising. Suggesting that the quoted odds are fair and actually can be beaten by using a website like Oddschecker to source the best prices. After 15 minutes the ROI difference is still positive, although only at 0.2% – but still the point remains that the advised odds can be matched as long as betting within 15 minutes. Beyond that – we did see some movement with a drop of 17.8% ROI down to 36.6% if betting at 10.30am and a 30% ROI drop at SP. The latter is not surprising as no-one should bet at SP these days, but what it does tell you is the edge The Betting Man has over the market. To summarise – it seemed clear to us that as long as backing The Betting Man’s selections within the first 15 minutes, you should easily match, if not beat his advised odds and obtain a similar level of performance. There is movement come 10.30am although we do have a concern that the drop off in ROI is somewhat exaggerated due to the exceptional run of form during this tracking period. In each review, we also examine the potential profitability of following any such tipster on the betting exchanges, including at Betfair SP after 5% commission is deducted on each winner. Despite this strong performance, we would prefer to see a larger sample of bets first before recommending this as a bonafide Betfair SP service, although it is certainly an angle worth keeping an eye on. You can read our very detailed review of The Betting Man and 2 other winning tipsters in SBC 108 – which is available to download the instant you join the Smart Betting Club as either a Silver, Gold or Platinum member. And for those of you interested in joining The Betting Man, we have secured SBC members the chance to save up to 50% on the cost of membership in an exclusive deal. If interested in this deal – BE QUICK as news reached me this morning that they will be closing to new members at the end of December and a waiting list will be put in place. This in order to further protect the odds availability of those tips. So if you wish to both join and SAVE up to 50%, you need to move quick. Described by SBC members as ‘The best service I have ever followed‘, ‘Peerless‘ and ‘Highly recommended if you are serious about making the game pay‘, you can read our full independent analysis in this complete review. …And for those of you interested in joining The Betting Man, we have secured SBC members the chance to save up to 50% on the cost of membership in an exclusive deal. You can read about The Betting Man and 2 other winning tipsters in SBC 108 – which is available to download the instant you join the Smart Betting Club as either a Silver, Gold or Platinum member. Why SBC Reviews Are Different! Independent, Expert Analysis: SBC has been reviewing tipsters since 2006 so we know what to look for when it comes to making a profit betting. Best of all, as we are 100% independent (never using affiliate links in our reviews) you can be assured that when we say something is good, it really is. Odds Availability Reports: When scrutinising horse racing tipsters, its vitally important to understand just how easy (or hard) it is to get the advised odds. Our unique odds availability studies (published in each review) track this and keep you fully informed on the best tipsters not just in theory, but practice. Exchange Profits & Suitability: For every tipster that goes under our review microscope, we also examine the profits that can me made following them on betting exchanges. Marking out those suitable for those of you unable to bet with traditional bookmakers. Ratings & Recommendations: Alongside our detailed review, we also provide you with informed ratings and recommendations on those tipsters we encourage you to join to make you money betting. Helping you find the best tipsters quickly. You can access your own copy of SBC 108 and our entire back catalogue of magazines the instant you join the Smart Betting Club. Best of all, you can also now save £45 on the usual cost of a Smart Betting Club membership as part of a special 2018 discount we have on site. This is because I have slashed the price of joining to ensure as many of you as possible have access to SBC’s expert reports, magazines and guides. All Smart Betting Club membership options (Silver, Gold and Platinum) offer access to SBC 108. Simply choose the membership option that suits you best (view the membership comparison table here) and once signed-up, you will be able to instantly download the guide.